New Puppy With White Face – Should I Be Worried? I am going to be bringing my Mini Aussie puppy home in about 6 weeks. He is my first dog, but my fiance grew up with a Golden and a Husky mix as a kid. I am reading up on everything out there to be as prepared as possible. Does he have too much white (ie double merle)? Neither parent is a merle, however, so I'm hoping he's ok.
Also, should I expect him to get darker and/or get more red spots as he gets older? I've looked at tons of red merle pictures online, but he seems to be lighter than most red merles out there. The breeder said that his eyes should be opening this weekend. Are blue eyes more common in merles compared to bi/tri colors? Comments for New Puppy With White Face – Should I Be Worried? Hi, first of all Merle is a dominant gene, therefore for your puppy to be a red Merle (as shown) one of the parents has to have been a Merle to pass that gene on to your baby. As far as worries about him/her being a double merle, this only occurs when both parents are Merle. With that being said, your puppy looks like a perfectly normal colored red Merle. Not like a double Merle looks at all. It is very likely more color and intensity of color will develop as she ages. Beautiful puppy!! Enjoy! I am curious with your statement "neither parent is merle" as a merle puppy cannot come from two non merle parents. If his parents do appear to be solid, one MUST be a cryptic/phantom merle (where they look solid but are indeed genetically a merle - sometimes you can see slight merle-ing in the hard to see areas). Otherwise, a different dog has bred to the female than what they maybe had thought, haha. The "merle gene" is an incomplete dominant meaning that with no copies the dog is solid, with one copy the dog is merle, and with two copies of the gene the dog is double merle. Unless both of his parents are somehow phantom merles you will not have to worry about double merle. Some merles just have more white than others. Finally, yes, blue eyes do tend to be more commonly seen in merles although they can show up in any of the colors. I've seen aussies of each and every color with blue eyes. I hope this isn't a make or break though, as lots of people want aussies for their "striking eyes" and then the poor pup ends up in the shelter once people realize how much work owning an australian shepherd can be. First, one parent has to be a Merle genetically because he is a merle. They could be a cryptic merle or minimum merle, but still a merle. His white makes him not to breed standard, because he is white around his eyes. So he is a mismatch red merle. I can't see his left ear but if it is white or partially white he could have hearing issues caused by lack of pigment in the inner ear. He will make an adorable pet. Have you met the parents? Because only having a parent who is a merle can produce a merle baby. If both parents are merle, it is the only way to get a double merle with a lot of potential health problems. One merle parent and one tri parent produce a mix of puppy patterns, all normal. White face is okay, as long as both parents are not merles! As for darkening, the puppy probably will, but will not gain pattern of the face unless the parents are mixed with other breeds. He's a red-tri... just so happens his face is white. You shouldn't worry at all, since the parents are both tri colored. Don't worry about his looks, worry about training your new pet and getting the right exercise. Aussies are not the best choice for a first dog they are very intelligent. Good luck. Hey, he looks like a real cutie! Don't worry about the white, his coat will change as he gets older and it will not look like so much white. He may get adorable spots on his nose too! Even if both parents are not red Merles they are red factored so will produce these types. I have a 13 yr. old red merle. Yes, she did get darker as she got older. She has one blue eye, and one amber colored eye. Wonderful dog, my baby. I am not sure what your concerns are for the puppy. You only need to make sure he is healthy. Hey there, I actually have a Pure Australian shepherd. I sent out his registration papers. And turns out that he is called A lethal white Aussie. Because of all his white, which I didn't know was even such a thing. Considering his parents aren't both merls either. Dad is blue Merle. Mom is a red and white. On the bright side he is completely healthy. Weighing in at a whole 50lbs at just shy of 8 months. As I was doing research on the lethal whites. I understand the double Merle but karsin (my dog) he isn't deaf or blind at all. Completely healthy and nothing phases him. So just cause there is to much white doesn't always mean that they will be deaf or blind. I just turned down a pup because she was mainly white and had all white ears. She appears to hear fine now but after some research I found that hearing difficulties can show up from 6-12 months old. If both ears are also white, whether double merle or not, the puppy has a large chance of being deaf in the all white ear. I can only see one ear, and it appears to have color and should be fine. But what about the other ear? If the breeder told you that neither parent is a merle, then find another breeder. At least one parent is a merle. I just had a litter, and one of my puppies looks like this too. 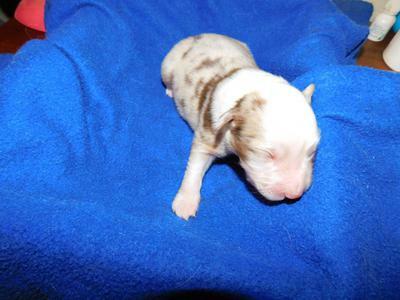 It’s parents are a merle and red tri, so I’m hoping it is going to be healthy and normal. However, you do not need to be bound to this puppy if given false info. One of its parents had to be a merle. So my question would be were you lied to about the parents. Are both of them merles. You need to see a picture of this puppy nursing on it’s mom or else a genetic dna test before you adopt him. Again, if he is a merle, then absolutely at least one of his parents is a merle!